Tummy time is essential for developing strong head, neck, and shoulder muscles as well as defining certain motor skills. The Fill ‘N Fun Water Play Mat is the perfect tummy time activity with water and brightly colored friends to entice babies. With the Fill ‘N Fun Water Play Mat, young ones can experience water fun without even getting wet! Rain or shine, youngsters can have fun in the sun with this brightly colored inflatable play mat that has delightful underwater scenes, fun fish, and a smiley sun painted around the edge. Simply fill the inflatable edge of the mat with tap water and kids can have hours of tactile and visual fun! The play mat is made from heavy gauge plastic which resists leaks and tears. It folds flat when the water and air are let out which makes it a great take-along toy that easily fits into a diaper or toy bag. Earlyears, an Epoch Everlasting Play brand, is designed for developing young minds. They boast safe, award winning, high quality baby toys that stimulate and develop sensory, motor, cognitive, and social skills. They make toys for any baby from newborns to 12 months and older. Package contains (1) Earlyears Fill ‘N Fun Water Play Mat for Tummy Time. The play mat includes 6 fun friends, starfish, octopus, sea horse, turtle and 2 fish. The play mat is made from heavy gauge plastic which resists leaks and tears. Measures 20" x 17". For ages 3-18 months. ENCOURAGE BABY DEVELOPMENT: Tummy time is essential for developing strong head, neck, and shoulder muscles as well as defining certain motor skills. The Fill 'N Fun Water Play Mat is the perfect tummy time activity with water and brightly colored friends to entice babies. TAKE THE OCEAN ANYWHERE: With the Fill 'N Fun Water Play Mat, young ones can experience water fun without even getting wet! Rain or shine, youngsters can have fun in the sun with this brightly colored inflatable play mat that has delightful underwater scenes, fun fish, and a smiley sun painted around the edge. EASY TO USE: Simply fill the inflatable edge of the mat with tap water and kids can have hours of tactile and visual fun! The play mat is made from heavy gauge plastic which resists leaks and tears. It folds flat when the water and air are let out which makes it a great take-along toy that easily fits into a diaper or toy bag. 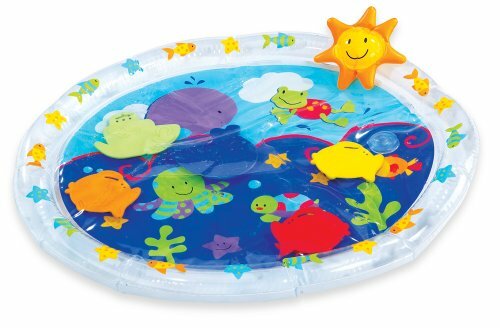 PRODUCT SPECIFICATIONS: Package contains (1) Earlyears Fill 'N Fun Water Play Mat for Tummy Time. The play mat includes 6 fun friends starfish, octopus, sea horse, turtle and 2 fish. The play mat is made from heavy gauge plastic which resists leaks and tears. Measures 20" x 17". For ages 3-18 months. If you have any questions about this product by Earlyears, contact us by completing and submitting the form below. If you are looking for a specif part number, please include it with your message.